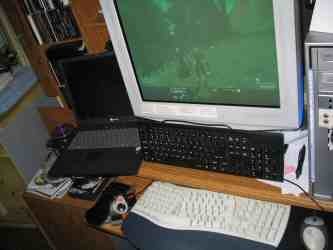 In this picture the black keyboard standing upright beneath the monitor is USBed into the laptop; the white keyboard, mouse, and Nostromo Speedpad are hooked to the desktop (my normal setup). So, I then logged the laptop in to a WoW character I have on my sister’s account, logged the desktop in to my own account and one of my oh-so-many cool characters, and after grouping the two characters together I played my own little mini-party for a while, controlling both characters simultaneously! 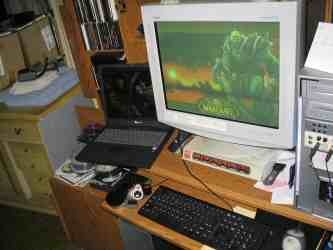 It definitely took some getting used to, but I had a blast – the desktop tanked and the laptop provided support. I’m not sure how fun this would be in an actually hostile area (we…um, I…were just bopping around the Undead newbie zone), and it’s not like I expect this to become the normal way I play the game (too hectic, not leisurely enough for my hippy streak) – but it was definitely a cool change of pace. I eventually realized that 99.5% of the time I never move my hands off the speedpad and mouse, so I swapped out my desktop keyboard for my laptop keyboard, saved a lot of hassle. With some practice I was actually able to run (as in jog) both characters simultaneously, using my left hand and the speedpad for the desktop character and my right hand and the keyboard arrow keys with my right hand. Now that feels weird! Anyway, just thought I’d share the love! (In case you’re wondering, no, this is NOT against the Blizzard Terms of Service – go ahead and ask ’em. I’m not using any kind of bots or hacks, only a few of the macro functions already built into the game, and both accounts are legal and paid for. It’s also not unethical, as anyone else with a laptop/second machine and a friend’s account can do the exact same thing … true, not everyone has those, but then not everyone has the one computer necessary to play at all, and I don’t see people giving up their WoW accounts in protest because some folks out there don’t have a computer.